Scuba Diving the Gili Islands is a year-round activity and one of the top things to do while here. With crystal blue waters, superb marine life and visibility up to 30 meters, Gili Trawangan is home to some of the most renowned scuba diving in Indonesia. Our sister business Compass Divers is a brand new dive center catering to all levels of divers, from beginners who who have never tried diving before all the way up to Dive Master Training. It is worth noting that all dive centers on Gili Trawangan are part of the Gili Island Dive Association ( GIDA )and as such there is a price agreement in place to ensure the best possible levels of service, properly maintained equipment and safe diving practices. Compass Divers specializes in small dive groups, flexible schedules and a relaxed diving environment. They offer a more intimate experience rather than feeling like just another customer. Discounts are available for online bookings and packages when staying with us at Broken Compass. If you are interested in doing any type of scuba diving check out Compass Divers Trip Advisor , Facebook or send them and email. If diving isn’t your thing but you still want to swim with turtles there are many snorkelling trips that leave Gili Trawangan daily and take you around the three Gili islands. Most trips leave at around 10am, have three or four snorkelling stops, drop you off in Gili Air for lunch and then return at around 3pm. Alternatively, if you would like to be on your own time schedule you can hire snorkelling gear from anywhere on the beach and just head into the water. The best spot to do so is in the north/north-east part of the island where there is less boat traffic and more coral reefs. 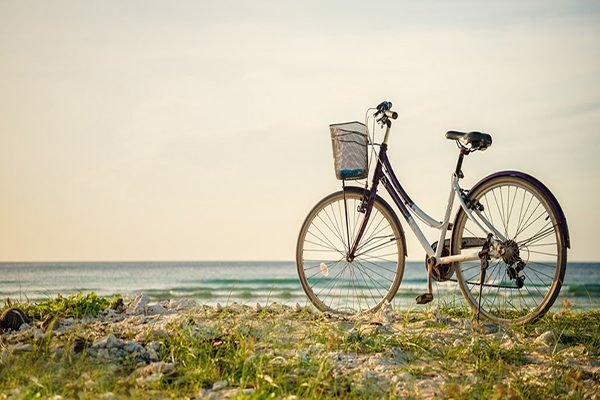 Cycling around the island is a must for anyone visiting Gili Trawangan and is a fun and fast way to explore the island and get around. There is one road that runs next to the beach all the way around the island (some parts are quite sandy and you may need to get off and push especially in dry season!) and also paths through the middle of the island where you can cycle through the coconut groves and local villages. Out of respect for the local Muslim population please make sure you cover up when exploring the interior part of the island. We have a selection of bikes you can rent at Broken Compass. The bike hire is ran by our local staff who earn all the profits made. You can rent canoes and stand up paddle boards from several places along the main strip, which is a great way to stay fit on your beach holiday and explore the waters around Gili! The price is normally 100,000Rp per hour. It is also possible to do some water skiing and para-sailing with Get High, who are situated at Lava Bar on the main strip. Yoga is a very popular activity to do on the Gilis and we are very lucky to have some excellent and professional centres on the island. There are daily classes at Gili Yoga, The Yoga Place and Soraya Yoga. Fly High yoga has also recently been introduced to the island and is a great new way to stretch those muscles and have fun dangling upside down!